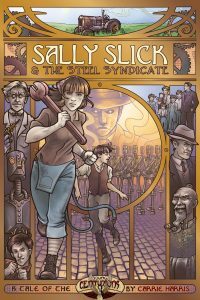 Sally Slick and the Steel Syndicate visits a 14-year-old Sally Slick in the years before she grows into her role as a Spirit Centurion. It introduces us to Sally’s fellow Centurion Jet Black and a host of supporting characters, both villainous and otherwise. 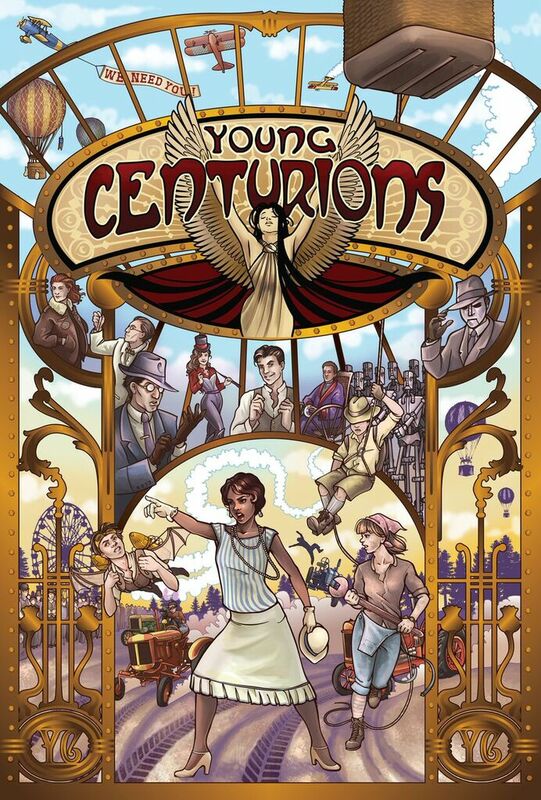 The novel sets the stage for the Young Centurions RPG, from 1910-1916. The first time I read this book I was charmed and very impressed; the second time I was still charmed but more aware of the story’s flaws. It’s a good book, the content aimed solidly at a teen and pre-teen audience with high-school reading skills. The story: The title promises a story centered around Sally’s conflict with the Steel Syndicate, but I think a more accurate title would be “Sally Slick and Her Marvelous Racing Tractor”. Sally’s older brother has gotten involved with the organized crime ring known as the Steel Syndicate, and when he falls into their clutches it’s up to Sally to rescue him. It’s the kind of adventure that every kid dreams of having, the one where you become invaluable to the people you look up to the most and they begin to see you in new ways. The charm: The story evokes the feel of the classic Tom Swift novels, in which the teenage heroes are the only ones in the right place at the right time with the right technology to defeat the villains. Sally hasn’t really discovered romance, a boyfriend is someone who makes you feel funny when you hold his hand. The stakes of the adventure are serious, and Sally takes them on in a manner appropriate to both her age and her time period. It compares very well to The 39 Clues, another series about extraordinary young people. It’s the kind of book I consumed voraciously as a kid. The writing: I blew through this book in an evening; it’s not really meant for adults. The writing is aimed at elementary and middle-school kids with a high-school reading level. The story construction is straightforward, moving from plot point to plot point with direction and clarity. Author Carrie Harris keeps things moving at a good pace, not skimping on the action but still giving the reader an opportunity to catch his breath. Kids with good reading skills will enjoy this book and kids with lower-level reading skills will find it both challenging and engaging. The content: When I read this the first time, I was really impressed by the content of the book. The characters deal with situations in a manner appropriate to their youth and to the time-period of the setting. The violence has not been sugar-coated, but neither is it graphic. The language is mostly inoffensive, with one or two curses you won’t find on a kid’s TV show; I’d still be willing to read it out loud to my mother’s grandkids. Harris avoids any kind of awkward preteen romance, opting instead for a very naturally awkward interaction when Sally suddenly realizes her best friend is a boy! This is an adventure story, accept no substitutes. Upon reflection: I spent a little more time on my second reading and still came away favorably impressed with the story despite a few flaws. The story lacks the agency of the Tom Swift novels. Sally spends most of the novel reacting to her circumstances instead of reaching out and changing things. It leaves the reader with the impression that this character is someone to whom things happen rather than someone who makes things happen. If the Tom Swift novels predicate action on the improbable, “Steel Syndicate” is built around the implausible. It’s easier to suspend disbelief in the Swift Repellatron than to believe an organized crime syndicate led by the ego-maniacal Steel Don would first pursue their quarry to the Slick farm over a grudge and then abandon their assault without suffering a single casualty. The story also lacks the educational value of The 39 Clues. With the story so tightly focused on Sally and her problems, it leaves the reader no time to explore the world before the advent of the Great War. The world of 1910s America was radically different from what we know today. Kids had a great deal more freedom to come and go, but going long distances was much harder. Social attitudes varied dramatically according to geography, with huge differences between urban and rural areas. The close of the previous century and advent of the new one has seen an explosion of immigration to all parts of the United States, with a corresponding culture shock for Americans both new and old. 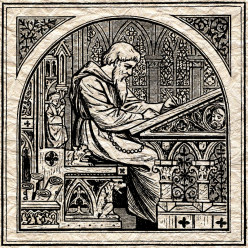 The lack of modern refrigeration, widespread electricity, or portable communication presents challenges to modern thinking that were a part of daily life at the time. There is a missed opportunity here to challenge young readers with unfamiliar ideas and situations. The verdict: This story structure has Sally rushing from encounter to encounter, only taking time between action scenes to gear up. It feels very familiar… it feels like a role-playing game session, which I suppose is intentional. RPGs are Evil Hat’s primary product and the Young Centurions RPG in particular has a very counter-intuitive play structure. This book actually describes the structure of a Young Centurions game blow-by-blow, even to the point where the villains “concede the scene” in the climax of the final showdown. New players and Game Masters could do much worse than emulating this story for their own sessions. It makes for a fantastic adventure game for any age group, but doesn’t really hold together as a story meant for adult examination; the less critically demanding young readership ought to be extremely satisfied. I got my copy of Sally Slick and theSteel Syndicate from the original Fate Core Kickstarter, but when Evil Hat’s Magic 8-Ball selected me to review upcoming products, they also provided me with a digital version. 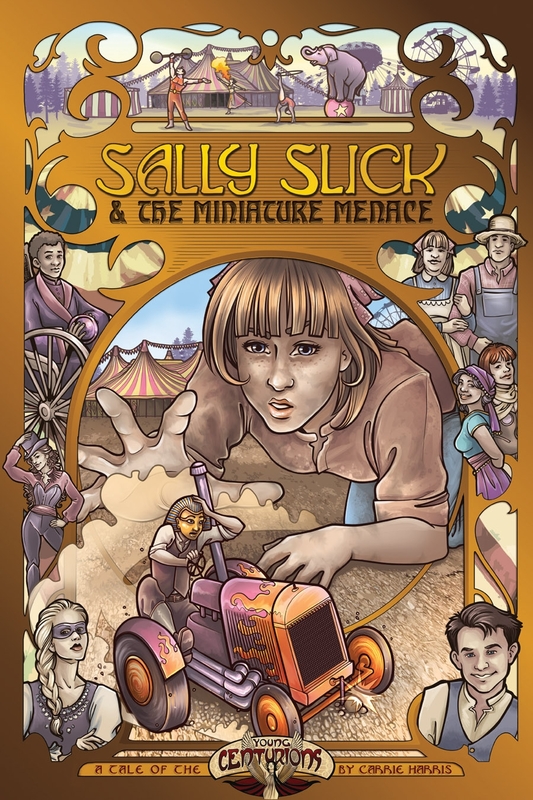 I’ve already reviewed theYoung Centurions RPG; the next Sally Slick novel, Sally Slick and the Miniature Menace, is next on my list. I’ve really enjoyed Carrie Harris’ writing, and I’m looking forward to Sally and Jet’s next adventure. See you then! Summer is upon us! Curt and I are back in the reaction chamber and gearing up for the summer. We’re looking at a wave of summer blockbusters starting with the awesomeness that is Godzilla. We talk for a little bit about the Dean Devlin/Matthew Broderick entry in the franchise. After beating that dead lizard for a while, we switch to Evil Hat’s Fate Core system. I’m prepping to release a book for the system and pushing out a Kickstarter campaign to help fund it. I’ve got some awesome artists signed on to work on the project. Check them out in the show notes! The artwork here is my own little scribbling for concept; Matt Silber is working on proper cover art and logos!